The sequel to Where No Vultures Fly again features Anthony Steel as African wildlife conservationist and game warden Bob Payton. 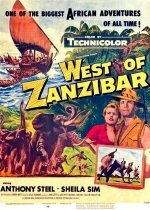 In this second film, Payton's wife is played by Sheila Sim, replacing Dinah Sheridan but perfectly transferring the social graces of Tunbridge Wells to the African bush. The emphasis is on travelogue material and shots of animals, most of which were rehashed from the earlier film. Drama is trumped up by ivory poachers and the ravages of drought and while the film's heart is in the right place it all seems simplistic and racist today. It was banned by the Kenyan government, then in the grip of the Mau Mau uprising, who felt the film was patronising.